Almost more than artists, art critics today form an elite class that legislates cultural tastes. The Crisis of Criticism is a collection of brilliantly argued, provocative essays that address the problematic nature of the critic’s authority and responsibilities. In it, today’s leading critics, curators, and artists address the questions at the heart of criticism. Do critics grant cultural permission or is their work merely descriptive? Is there such a thing as critical activism? How can critics bridge the gap between a sometimes hermetic art community and the public? Are critics consumer advocates, sycophants, or artists in their own right? 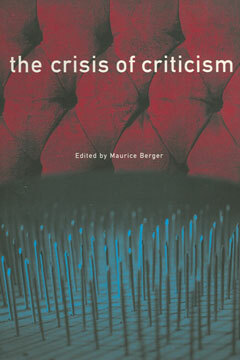 Maurice Berger assembles the top critics in each field to address the problematic nature of the critic’s authority and responsibilities. Contributors include Richard Martin, bell hooks, Jim Hoberman, Arlene Croce, Wayne Koestenbaum, Joyce Carol Oates, and others.